Today’s world is full of technology and chaos, and now technology is to thank for a new suicide machine that allows wanting to take their own life to do so in a manner that is peaceful and orderly. The machine is called Sarco, and it has been called a technological marvel, and it takes on the looks of a futuristic sleeping chamber, but it helps with suicide. The new chamber was revealed by Philip Nitschke from Australia, and he has been called the “Elon Musk of assisted suicide”. The machine was revealed this week, and this was just a few days after lawmakers in Victoria had a vote on legalizing euthanasia. The device is said to simplify what Nitschke calls “rational suicide” and makes sure that the whole process of suicide is easy and very painless and is what he says is the optimal way to die. The organization of Nitschke is called Exit International, and it is this company that developed The Sarco machine. The company is said to be an “aid-in-dying” organization. The Sarco comes with a base that has a translucent chamber on top, and it is said to be in perfect proportions for a human to get into. Upon getting into the pod, the chamber begins to fill up with liquid nitrogen, and this will bring down the level of oxygen to only around 5%. Nitschke said that within a minute the person inside the chamber would become unconscious and they will not be able to feel any pain. The doctor said that this is similar to depressurizing the cabin of an airplane. He went on to say that when the person has died, which occurs swiftly, the chamber will then become the coffin of that person. The base of the chamber, on the other hand, can be reused. Exit International gave a press release, and they said that The Sarco is designed to allow it to be 3D printed. It can then be put together in just about any location. He went on to say that the blueprints are going to be made available freely; open-source and they will be put onto the internet. Accessibility is one of the biggest selling points but there is going to be a big hurdle that people considering it will have to overcome, and this is by way of a questionnaire. 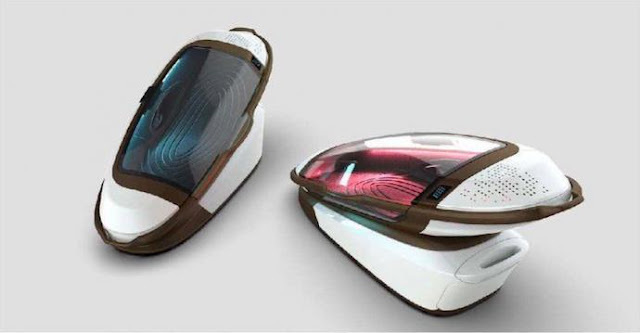 The questionnaire will eb made available on the internet, and the client who wants to use the chamber will first have to establish their mental health, and then they will then be given a code with 4-digits that will open the door of the capsule so that they can use it. This is said to be the first of many steps that lead to death that is peaceful, within a few minutes. Suicide clinics in Sweden have shown some interest in licensing The Sarco and hoped to use it in their clinics. It is also thought that others may be interested around the globe. Assisted suicide is now legal in Canada, Colombia, Belgium, Luxemburg and the Netherlands, along with Victoria, now that the new law is in place. In the United States, only patients that are terminally ill are able to take the suicide route. In numerous states, two doctors have to verify how legitimate the request is. State-specific legislation governs over “death with dignity” laws in the states of Colorado, California, Oregon, Vermont, D.C, and Washington. There has been a rise in support for choosing how and when to die in 2016, 69% of people in the United States said that a patient’s life should be allowed to end painlessly with the help of their doctor. In 2017 this number rose and reached 73%. Philip Nitschke is an advocate for euthanasia and wants it to be legal for anyone who is over the age of 70 years. He has continued to push for assisted suicide and wants it to be a civil right. He went on to say that a grey wave had washed over Baby Boomers and this had helped to bring about a change in the way that people think. He continued by saying that people are used to having their own way and running their own lives. He said that many women had been through political battles in regards to issues such as the pill, rights of abortion and feminism and they do not want to be told how they should die. He went on to say that they do not want to be patted on the head and then be told they have to let the doctors decide when they should die. The lives of people should be just that, people’s lives and their death should be one part of it, and so they should be the ones who make the ultimate choice over their own death.